So basically I don’t have anything new to say, but I recognize that I’ve left the blog fallow for a week, and well, I feel somewhat obligated to at least say hello. Hi, there! 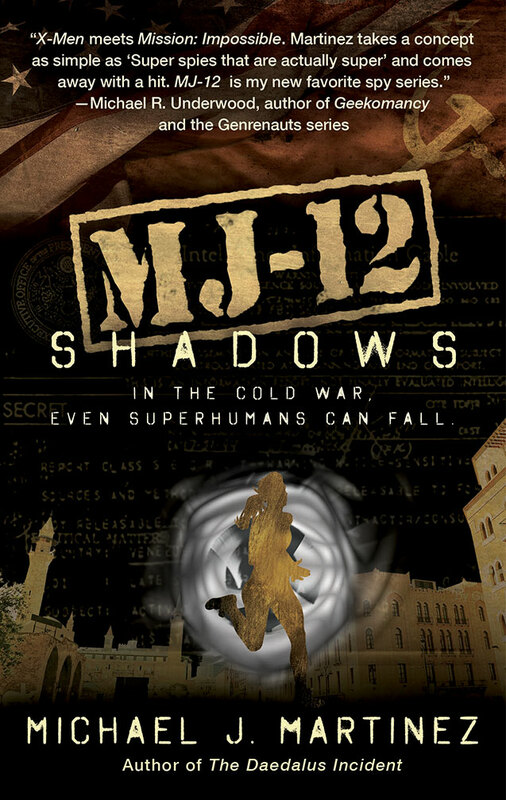 I’m crunching on the final revisions to MJ-12: Shadows, the sequel to this year’s MJ-12: Inception. You won’t get to see it until late next summer, of course. For whatever reason, this one was a tougher nut to crack, story wise. Or maybe it was just writing it on top of an unusually busy year for me. Hard to say. But I’m liking how it’s turning out. Hope you will too. I’m also resisting the urge to work on something super-shiny that the Muse is incredibly excited about. Actually, she’s shrieking in my ears about it constantly, and I’m excited about it too. It only exists in about ten pages of notes at the moment. It’ll need to stay that way for a few more weeks yet. Shut up, Muse. I got stuff to do. The whole election thing…yeah. Still sitting poorly with me, and it’s not like the incoming administration is inspiring confidence with its various gaffes and horrible appointments. If you’ve seen my Twitter feed, you’ve seen I’ve been more political of late. That’s not likely to change. As I explained to my kid, this is our time to stand up, just like the suffragists in the ’20s and the civil rights activists in the ’60s. And I’m gonna do that. Martinez is truly a gifted writer in that MJ-12: Inception has a distinct and utterly different flavor than his previous series. Although I only know about organizations like the CIA from books, movies and literature, his portrayal of the inner workings of government programs seems authentic. I enjoyed reading the confidential reports written from the perspective of top officials in the CIA. Martinez, a master at genre blending, has created an exciting new series by mixing a pinch of James Bond to a dash of the X-Men and then combining that with a dose of politics and old-fashioned cloak and dagger espionage. Dude. That’s pretty swell, as they might say in 1948. You can read the whole review here, along with a guest post I wrote about my approach to writing a brand-new series. I’m writing this in the cafe at Borderlands Books in San Francisco, which explains the rather meta image attached to this post. It’s also another lovely excuse to remind you that Borderlands is pretty much the only game online right now to get a signed copy of MJ-12: Inception, and they also have the Daedalus trilogy books in stock with my scrawl on them. Click here to get started! Here’s something to look forward to: I recorded a Ditch Diggers podcast today, which should land online over the next few days. It was incredibly fun, and hosts Mur Lafferty and Matt Wallace are the absolute best. I’ll ping everyone when it hits, but in the meantime, there are far worse ways to spend your time than checking out past episodes, which include conversations with fantastic humans like Fran Wilde, Kameron Hurley and Chuck Wendig. I’m heading home Saturday, and really looking forward to that. San Francisco is lovely. Borderlands is amazing. DragonCon was its usual fantastic awesomeness. But you know, I’m good with the travel for a bit. 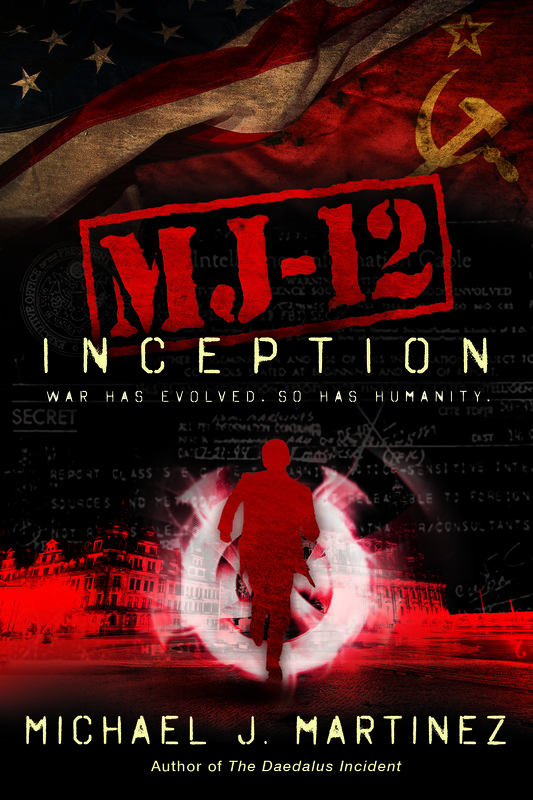 Thank you all yet again for all the love and support you’ve shown MJ-12: Inception. It really matters and you’re all awesome. Yeah, there’s a headline I’ve never written before! But it’s true. I’ve been playing with BBQ sauce recipes for years now, starting off with a basic recipe — equal parts ketchup, mustard, molasses and apple cider vinegar — refining and playing with it ever since. And today on Fran Wilde’s Book Bites, you get to enjoy the results of all that experimentation. 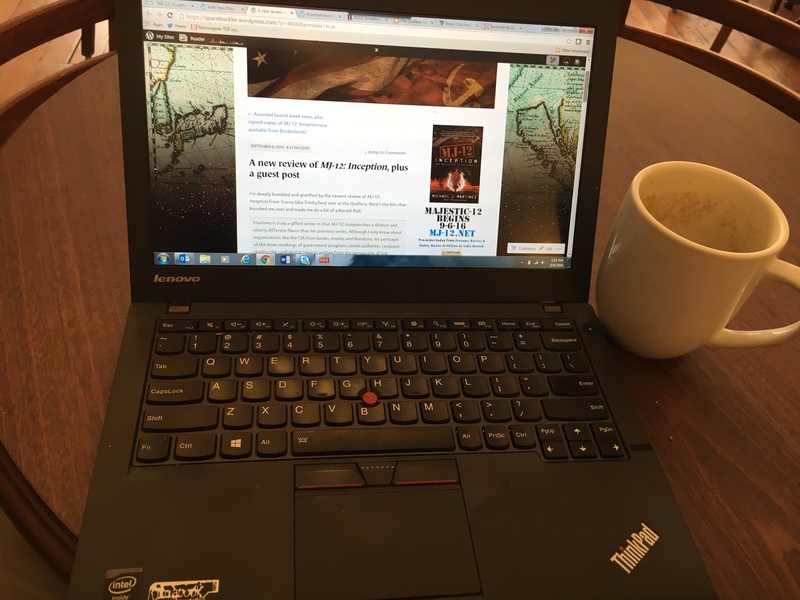 My thanks to the luminous and crazy-talented Fran Wilde for having me on her Book Bites blog. She’s totally aces and you need to be reading her award-winning books, y’all. Plus, she’s a great human to hang out with at a con. Speaking of cons, this is my last full day at DragonCon, which has been the usual excellent experience. 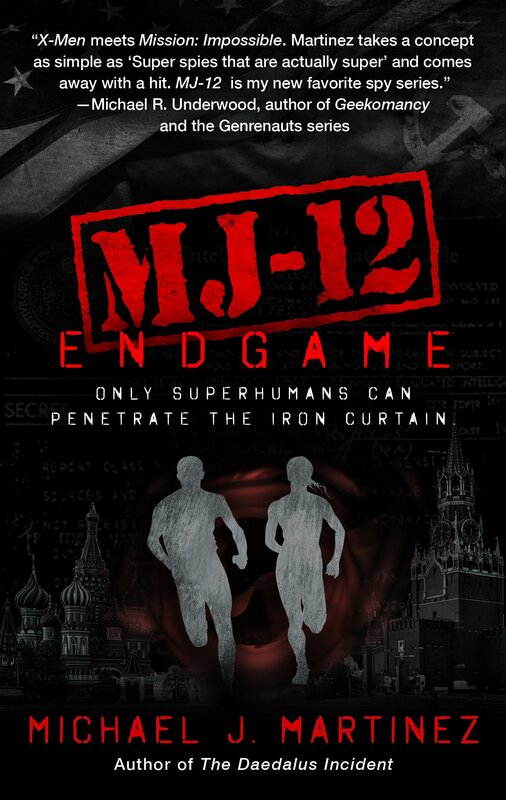 There’s only a handful of copies of MJ-12: Inception left at the booksellers in the vendor hall, so get thee hence or wait until Tuesday when it hits bookstores. Of course, if you wait, those copies won’t be signed. Just saying. Finally, here’s your regular reminder about Tuesday’s launch-day reading/signing at Borderlands Books in San Francisco at 6 p.m. If you’re in the area, come on by and say hello! I’ll be at Borderlands Books in San Francisco one week from today! Borderlands Books is awesome. Seriously, it’s one of the very best bookstores I’ve ever visited. Alan and Jude are fantastic people, and the staff is frighteningly knowledgeable and yet completely friendly and accessible. My wife did an article about their sponsorship model last summer, and I’m glad to report they’re still going strong. So when I say I’m excited to launch MJ-12: Inception with a little reading and signing there, you know I mean it. MJ-12: Inception launches next Tuesday, Sept. 6, in hardcover, and I’ll be at Borderlands starting at 6 p.m. to do stuff. If there’s a big audience, I’ll do a formal reading and Q&A, and if we’re small but mighty, I’ll do the same…with less formality? Whatever. I’ll bring beer. It’ll be fun. If you’re in the Bay Area, I totally hope to see you there. And if you can’t make it, well, I’ll be signing whatever they have on hand, and you can give ’em a call and have them ship a signed copy directly to you. They’re awesome like that. 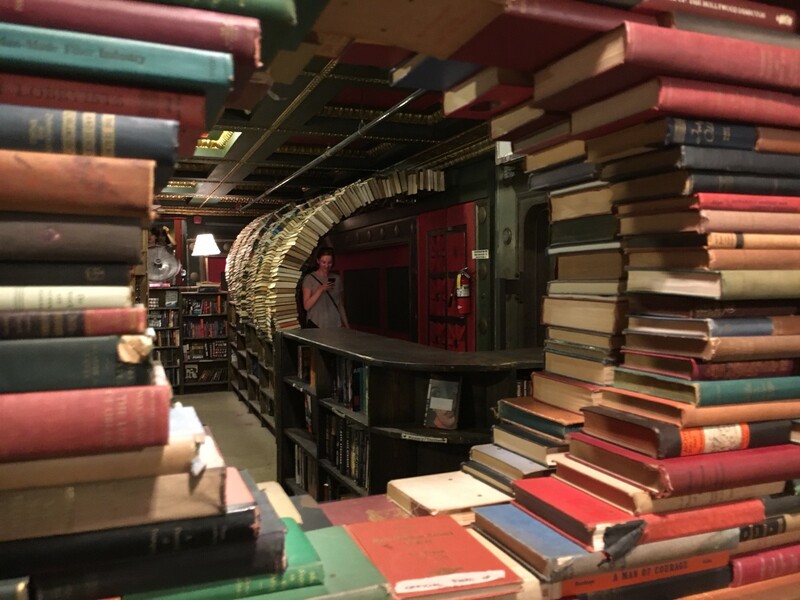 Also, if you’re in the Bay Area, or even if you’re not and just like the idea of helping out fantastic SF/F bookstores, I strongly urge you to consider becoming a Borderlands sponsor. You’ll be supporting a key piece of the SF/F community — not just in San Francisco, but throughout the country. 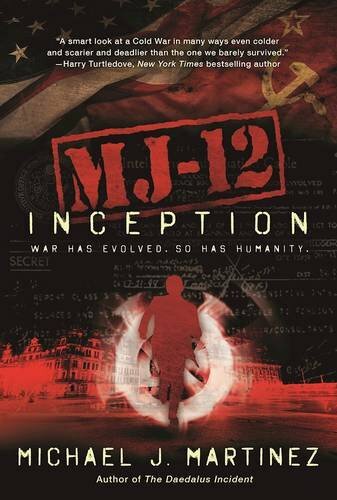 One more note: the Goodreads giveaway of MJ-12: Inception wraps up tomorrow night at midnight. So if you haven’t signed up yet, do it! If you follow this blog, you generally like good writing, right? Of course you do! So here’s a great opportunity to attend a super-cool reading by attendees of the inaugural Cuba Writers Program this coming Monday in New York City. The reading features Cuba Writers Program instructors and students, including Alden Jones, Donna Bolding, John Hill, Beatrice Hill, V. Hansmann and Katrina Woznicki. (Full disclosure: Katrina is my wife. She’s also a far better writer than I am.) They’ll be reading from their work, some of which came out of the program itself. And no doubt they’ll talk about the great program they had down in Cuba this past May. The reading is Monday, Aug. 22, at 6 p.m. at the Cornelia Street Cafe, which is at (unsurprisingly) 23 Cornelia St. in New York City, right by the West 4th subway station in the West Village. I’m told it’s a very cool space, and I’m looking forward to all the great writing and everyone talking about their experiences in Cuba. So come out and support these great writers, have a snack, be entertained, feed your brain. See you there! I’ve been in my current day job now for nearly nine years. In addition to the gig’s intellectual challenges, sturdy rewards and lovely people, it’s allowed me to visit Los Angeles at least…heck, 25 times or so? See, the New York office is actually the satellite, while the mothership is in the City of Angels. Hence the travel and the sturdy flow of frequent flier miles. So here I am yet again, this time for a week and a half. My wife is with me (the child being at camp) and there are plans afoot. L.A. is a great city for warmth, sun, beaches and sightseeing. (The less said about traffic and smog, the better.) The food scene here is phenomenal — super creative, far less pretentious than New York, and surprisingly affordable. There are many fine craft breweries. And there’s The Last Bookstore. I’m ashamed to say that I hadn’t visited until today. This has been belatedly but duly rectified; it’s one of the coolest independent bookstores I’ve ever seen. Want proof? Here you go. First off, it’s huge. The building used to be an old bank, so they have a couple of vaults and lots of smaller rooms in addition to this cavernous affair. The stage is perfect for readings and panels, and there are a few chairs around — though, to be fair, they don’t like folks loitering all day. They’re right in downtown L.A., so I get that. 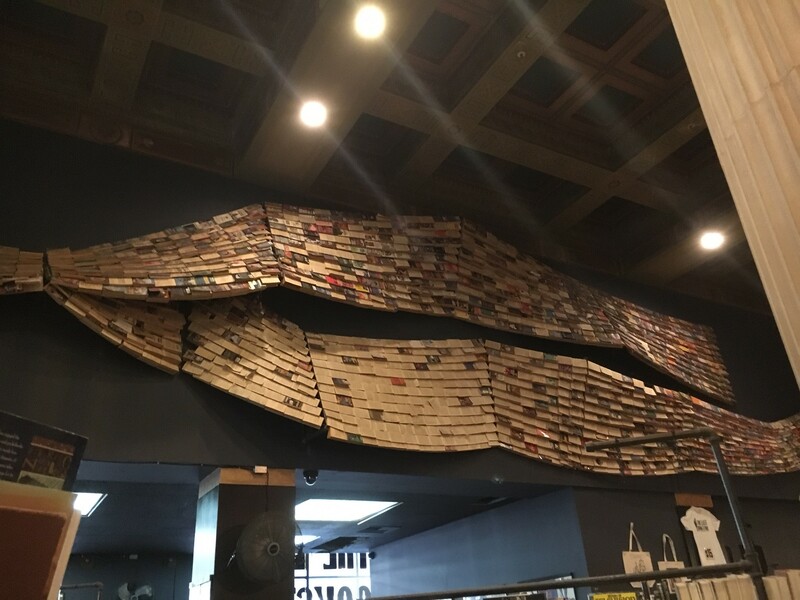 Book sculptures! Paper art! The second floor in particular is a warren of very cool little nooks and crannies and oddities like the ones above. And this bad boy towers above all of it. Someone put a lot of love into this store. There’s a massive collection of vintage, used and new books across every genre imaginable. You want self-help? YA? Biography? Classics? SF/F? Lit fic? It’s all there. Well, mostly all there. I suppose I could get nitpicky about authors of more recent vintage — they have the big names in most categories, but less so midlisters. But their used book selection more than makes up for it. I saw dozens of novels I read when I was a kid. It was a total memory lane thing. So. 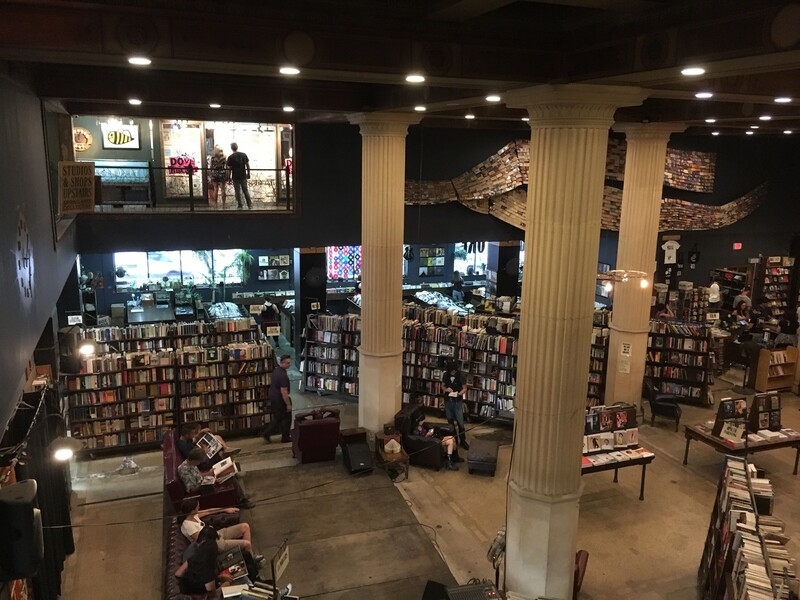 The Last Bookstore is in downtown Los Angeles on 5th and Spring. It’s worth braving the city’s notorious traffic to spend an hour in book-lover bliss. I’m glad I went, and you should go too. In other news, I’m happy to report that, as per usual, I crunched on a whole heap of words on my flight over here, and that the second MAJESTIC-12 book is coming along swimmingly. There was one particular historical event that really spurred the entire concept behind the book, and today was the day where I got to write my version of it. It’s one of those “you can’t make this stuff up” events, and I hope I did it justice. All right. I’m off to find a good taco and a beer. Viva Los Angeles.